"You primed the pump of my bread baking, which was on hiatus. 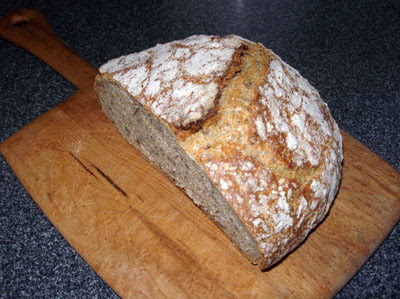 So here is a picture of a small corn rye with caraway made in the no-knead way. Looks wonderful. I've had several friends and relatives respond to my blog sharing with no-knead bread stories. "OK... we are bread bakers too... but SOLELY the No Knead Bread from the NYTimes, have you done this? It takes away all the pampering that you so lovely mentioned, but produces the exact same results, and it is ooooh sooo good. We even cut out the step #3, and it doesn't affect it at all. We just mix the dough-- wait 12-18 hours, heat up the container, and bung it in the oven!! A friend who runs a kitchen store says that the original no-knead bread article caused a run on dutch ovens. I sometimes make it and I like it a lot, but I do love kneading, and shaping, so it would never be my one and only. that looks so good! i'm still trying to figure out what I want to attempt to make. I'm such a disaster in the kitchen. Yum! It is my goal for this year to finally learn to bake decent bread! Mine always ends up like a rock on the outside and raw inside. Not so tasty. I look forward to seeing more of what you bake. I love the way a long rise fits into the flow of life.